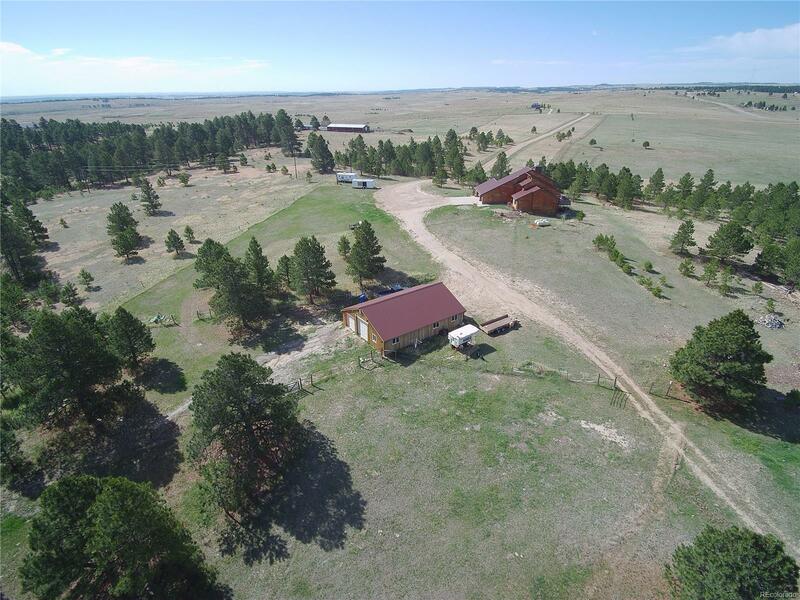 Mountain VIEWS from Pikes Peak to Long Peak; stunning property is 120 peaceful and private ACRES with pines trees and open meadows. Large home has lots of updates including newer heavy-gauge metal roof, windows and siding. Step inside to real hard wood floors, flowing main level with wood burner and a bright and sunny kitchen with newer appliances, new granite counter tops and sili-granite sink, lots of cupboard space and pantry. Sun room off kitchen is a terrific space for a formal dining room, art studio or lounge area. The main floor bedrooms are good sized but the master suite upstairs is private and large. Unfinished garden-level WALK OUT basement is ready for your finishes if you need it and has a pellet stove. SHOP/BARN is 36x48 has pull through doors with openers, full cement floor, 110/220 electrical and full-functioning studio apartment with electric baseboard heat. Shop also has newer metal roof. Rare large acreage with good location, 3 seasonal ponds and big pastures.